The Philippines used to be an American colony. Its main exports to the mainland–which were not subject to tariffs because, well, the Philippine islands weren’t a different country–were sugar and copra. Sugar (from sugarcane) was cheaper and of higher quality than domestically-produced sugar, which comes primarily from sugar beets. Copra is refined into coconut oil, which competed with other vegetable oils, animal oils and fats, and fish oils. In the 1930s, this especially meant cottonseed oil, which was turned into soaps. It also meant butter, because of recent innovations that meant that coconut oil could be partially hydrogenated and turned into margarine. Does the desire for protection from tariff-free sugar and copra imports explain the decision to grant the Philippines independence? The point is this: get the Philippines outside of our borders, and we can impose tariffs. Let’s look at cotton, sugar beet, and milk production across the states. Let’s also throw in sugar cane and the percentage of a state’s population that is of Filipino ancestry, and then compare that to Senate votes for independence in the Tydings-McDuffie Act of 1934 (which granted the Philippines self-government, later to become independence). You could do this with House votes on that bill too, but absent data on milk, sugar cane, etc. by congressional district, the results will not be particularly helpful. I’ve transformed sugar beet/cane production, cotton production, and milk production to an approximately logarithmic scale. The maps show that sugar beet and cotton production, taken together, unite most of the West with the South, and this is where most of the votes in favor of independence come from. Let’s look at this more formally. The dependent variable is the number of Senate votes in a state (0, 1, or 2). The independent variables are the (transformed) variables above, along with a measure of partisanship in each state’s senate delegation. I estimate an ordered logistic regression, with the results below. These results support the idea that cotton and sugar beet lobbies mattered; not so much support for the dairy lobby. 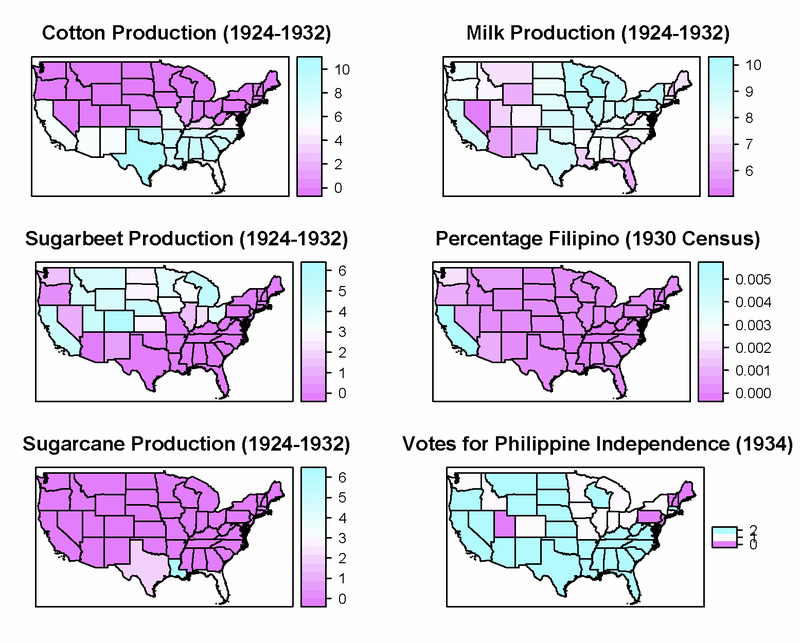 The huge, highly statistically significant coefficients on “sugar cane” and “filipinos” represent the fact that Louisiana (which produced the overwhelming majority of sugar cane) and California (which had the overwhelming majority of Filipinos) voted for independence. The question that this does not answer is why the U.S. did not grant independence to Puerto Rico or Hawaii at the same time. Both of these territories exported tremendous amounts of sugar to the U.S., so my argument would expect that there would be a demand to get them out of the U.S. too. There was an attempt to do so with Puerto Rico in the late 1930s (led by many of the same people), but it seems to have failed, and there was no vote on it. I’m unaware of any similar move for Hawaii. Any thoughts on this would be welcome. My hunch is that it has to do with the interaction of the structure of the Filipino sugar industry and the addition of copra as a main export from the Philippines. Puerto Rican and Hawaiian sugar plantations were owned mainly by Americans (contrast that to the majority indigenous Filipino sugar industry) and the other export products produced in PR and Hawaii (coffee and pineapples, respectively) did not compete with anything produced in the U.S. mainland. Input from the world’s leading authority of the expansion of the states westward in the 1800s would be most appreciated. Unfortunately, I can’t be of much help here. My dissertation research was purposefully limited to the continental territory because I specifically didn’t want to get into the strange politics of the external territories. It’s so different than the politics of state formation on the continent that it really is a whole different topic. In particular, the SCOTUS Insular cases (which set up the parameters of the relationship between the external territories, incorporated and unincorporated, to the nation) give rise to a true colonial politics, in which the territory is in serious danger of never becoming part of the union and never becoming an independent nation. That was certainly not true on the continent. In addtion, the external territories tended to have pre-defined geographies and cultures, and much of my thesis was about the politics of defining the cultures and geographic boundaries of the western states. 1) Hawaii, both at time of annexation and at the time of statehood, was very much dominated by agricultural interests, and Dole in particular. But the military outpost was also a major concern. 2) I can’t tell you why Puerto Rico wasn’t set free, but i can tell you one reason why it has never become a state: Congress has never admitted a state that did not show evidence of the desire to be a state; virtually every western territory held a popular ratification plebecite prior to submitting a proposed state constitution to Congress. Puerto Rico has held numerous votes on statehood, and none have ever shown a majority in favor of it. Those are interesting points–I guess I didn’t really consider just how different working on the external territories would be. But on further reflection, obviously yes, that’s gotta be true. On (1), there’s a nice parallel with Subic Bay/Clark Air Base in the Philippines with Pearl Harbor in Hawaii. What I mean is, the fact that the US wanted a military base in Hawaii doesn’t mean that we needed to make Hawaii a state. The dominance of the agricultural sector in Hawaii, esp. Dole, is really interesting. My question is whether these interests were in favor of statehood (one source I’ve read said that sugar plantation owners opposed annexation in the 1800s because that would mean that they would have to reform their labor practices), and if so, why there was not any opposition from import competing lobbies on the continent (or if there was, why it didn’t succeed). On (2), that’s really interesting too. I’m less interested in why the US didn’t admit PR as a state, and more in why it didn’t push harder to set it independent. Apparently, the draft bill from 1936 that would start PR on the road to independence (which was modeled on the 1934 Tydings-McDuffie Act) would have slapped huge tariffs on PR sugar, and that incensed the pro-statehood forces (backed by the sugar lobby) in PR. The question I have is, why didn’t the sugar lobby in the US push harder anyway? Interesting stuff. A few quick thoughts. (I’ve been playing around with a little work on US ag policy). 1. Sugar has historically been protected with quotas. So the size of the Philippines quota matters. If they were given a large quota, then the impact on prices is the same. Here is a doc that provides a little discussion. See page 4. But I would see if these commodity prices rose domestically in the Philippines. 2. It is hard to isolate commodities given the structure of committees, the impact of commodities on processors, and the use of some omnibus farm bills. Again, not 100% what this does for your argument. 3. There were systems of domestic production controls at the time. I wonder if there was some sort of option of reducing production in the Philippines without independence. 4. Looking at recent data, I have been struck by the difference between ag production and who gets the ag rents. Basically there are lots of rich people that own land (often through trusts) that are the main beneficiaries of ag protection. Thanks, Nate! This is really useful. I believe that there were simultaneous negotiations on quotas for sugar imports and on unprocessed copra. When you write “if they were given large a large quota, then the impact on prices is the same,” do you mean that if there was a high quota on sugar imports from Phil, then the quota would not affect U.S. sugar prices? Just trying to clarify. That document is really helpful, by the way. On 3, I’m not sure about production controls but I don’t think so. It certainly would have been an option, though. My argument should be able to predict why the U.S. didn’t try that. My sense is that Filipino independence isn’t a monocausal story, and that there was a real sense that the Philippines shouldn’t be kept a colony or made into a state. My argument would then say that given the fact that independnece was really likely, how did the interest groups line up when the votes happened. On 4, though, I think that this is getting at something. In the Philippines, there were some large US-owned sugar plantations but the rest were domestically owned, and much of it was worked by smallholders (if not owned by them). I think that the real argument against independence–at least on the terms that they got it–came from large Filipino land owners. Interesting arguments; I’ve been thinking through similar ones. As for the Philippines, though, I was wondering if you’ve also run the same analysis on the earlier Hawes-Cutting Act in 1933, which was also an attempt to declare Philippine independence. According to Friend’s great analysis of it, the same interests you mention also supported that act, no? Friend uses qualitative research to essentially land on your same conclusion. See Friend, Theodore. 1963. “American Interests and Philippine Independence, 1932-1933.” Philippine Studies 11(4):505-23. As for Hawaii and Puerto Rico, I do think it really does have to do with whether US corporations control the sugar or not; as was the case with both (and to some degree with Cuba, btw, which is a different matter). I’ve written some stuff along these same lines but haven’t finished the paper yet, but if you’re interested I can send it along – assuming I ever get it done! Thanks, Julian, for reading and commenting. No, I haven’t done anything on Hawes-Cutting formally, but I do see that Ted Friend’s argument is pretty similar. My contribution will have to be something else, more like explaining the absence of independence in Hawaii and PR given similar agricultural conditions. As you suggest, ownership of sugar plantations must have something to do with it, but I also think that the vote suggests that not just sugar, but cotton too, affected the vote, at least in the Phillipines. Please, please, do send me the paper you’re mentioning when you finish it! Great points Tom. My point on the quota size is that the size of the quota relative to the size of existing exports should be the key to affecting prices. If they get a quota larger than their current exports, then trade won’t be affected at all. But I really like your point on the idea that independence was likely, and that conditional on this, we want to see interest group behavior. Very neat.